World After yet another deadly mining disaster, will Brazil finally heed the human cost of its ambitious expansion plans? After yet another deadly mining disaster, will Brazil finally heed the human cost of its ambitious expansion plans? A month after a tailings dam collapsed and killed 19 people in the Brazilian town of Mariana in November, 2015, the legislature in the state of Minas Gerais gathered to consider new mining legislation. Congress members meeting 100 kilometres from the site of the disaster at the Samarco mine voted to reduce the role given to the Ministerio Publico, a government agency that typically advocates for environmental, Indigenous and public-safety considerations, in approving new mining projects. Of the 77 members in the state congress that passed the measure, 59 had received significant campaign contributions from the mining industry. Three-and-a-half years later, a second dam has collapsed, in the town of Brumadinho – the same kind of dam, owned by the same company, at another iron ore mine just 140 kilometres away. This time, 84 people are confirmed dead, and nearly 300 are missing, and now, four days later, presumed dead. “Brazil learned nothing from Mariana,” said Cristina Serra, a Brazilian journalist and author of The Tragedy at Mariana, an investigation into the first dam collapse. Police have arrested three employees of Vale S.A., which owns the Brumadinho mine, and two contractors, in connection with the Jan. 25 collapse. The public prosecutor says the Vale employees were involved in obtaining licensing approval for the project (which Vale recently sought to expand), while the contractors work for a German firm that performed safety studies and concluded the dam was sound. They will be held for an initial 90 days pending the laying of formal charges. If they or others are charged, it will be a sharp departure from the way the Mariana disaster was handled. A federal criminal case is proceeding at a glacial pace: It has 21 accused, more than 400 witnesses, and involves technical issues of great complexity, but it is overseen by a single judge in a small town in Minas Gerais, and the federal prosecutor’s office did not assign a support task force or a formal inquiry, Ms. Serra said. In addition, lawyers for executives at Samarco (jointly owned by Vale and BHP Billiton Ltd.) have filed motions questioning the validity of evidence; the case could drag on for years. Environmental crimes in Brazil face a sort of statute of limitations, which Ms. Serra predicted will be reached with no judgment in the Mariana case. Samarco was fined $129-million by Brazil’s environmental agency and the state of Minas Gerais, but has appealed the fines and has not paid yet. The Samarco dam, which was the height of a 30-storey building, released five times as much mining waste as the dam at Brumadinho – it poisoned a river system and polluted the drinking water of hundreds of thousands of people, sending a tide of reddish-brown toxic sludge 400 kilometres to the sea. Ms. Serra’s investigation after the Samarco incident found that in 2016, the National Mining Agency had a total of five specialists tracking tailing dams – of which the country has 663, including 460 in in Minas Gerais. When the dam gave way, it sent a wall of wet mud through the Vale administrative complex and nearby residential areas and into the Paraopeba River. The blanket of sludge, which leaves anyone near it with burning eyes and an itchy throat, is nearly four kilometres wide and stretches more than 10 kilometres over what was a sleepy town where big white cows occasionally strayed into the street and farmers sold cheese and preserves from small stands at the end of driveways on low green hills. The disaster came less than a month after Jair Bolsonaro took over Brazil’s presidency; in his campaign, he pledged to loosen environmental restrictions on private industry and expand mining across the country, including on Indigenous territory and in the Amazon. He had proposed to scrap the Environment Ministry, and when he was dissuaded from that plan, he gave the post of minister to Ricardo Salles, a lawyer who was convicted of altering maps to benefit a mining company while he was environment minister in the government of the state of Sao Paulo. The Bolsonaro government has been sending mixed signals about how it will proceed since the disaster. Mr. Salles has mused to reporters that Brazil may need to change how it requires mines to handle tailings, and scrap the wet dam method – a requirement that will be costly for mining companies. The reservoir-and-tailings-dam system is banned in some countries, including next-door Chile, where mining is a pillar of the economy. Brazil’s prosecutor-general, Raquel Dodge (who was not in the job when the Samarco collapse occurred), said earlier this week that Vale’s executives could be “severely punished” and may face criminal charges. Vice-President Hamilton Mourao suggested the government could insist that Vale’s board of directors resign (the government is the company’s largest shareholder). The National Mining Agency has frozen an initial $1.8-billion of Vale’s assets to pay for cleanup and damages. The company’s shares fell more than 20 per cent on the Brazilian exchange when trading began on Monday, three days after the collapse. A tailings dam is built, in theory, to be a permanent structure: The most common kind are made of dirt, pushed into place in successive layers by bulldozers, and they hold back reservoirs of sludgy leftovers from the extraction and milling of minerals. There is always a certain content of water in the sludge, which slowly erodes the dam and requires new dirt to be pushed into place. 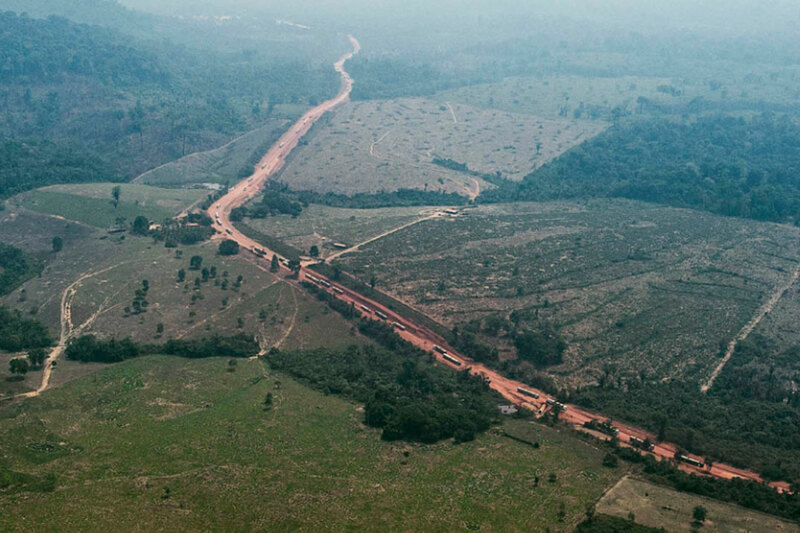 On a dusty, dangerous highway through the Amazon, Latin America correspondent Stephanie Nolen got to see Brazil’s battle between environmental protection and economic ambition up close. Take a look at The Globe and Mail’s full multimedia investigation.